Earn 180 loyalty points when you order this item. Monitor Audio C180T2 Stereo Ceiling Speaker features twin independent, pivoting 1" C-CAM tweeters and an 8" MMP II bass driver with dual wound voice coil for high-quality stereo sound from a single speaker. C180-T2 grants spacious stereo sound from a single unit making this ideal for small rooms where it is desired to fit only an individual speaker. It is perfect for spare rooms, studies and hallways. For optimal precision, your listening position should to be aligned with the treble or some of the accuracy will be lost. Owing to its smart pivoting tweeter design, C180-T2 is suitably equipped to combat this. Just direct the tweeter towards your preferred listening position within the room. 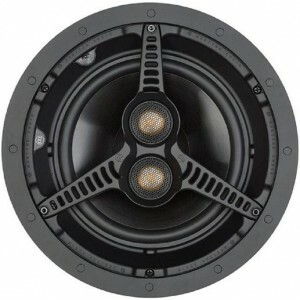 Using an 8" bass cone, C180 T2 is ideal for larger room applications and at higher volume levels. Larger coned design suits installation for higher ceilings, where sound has further to travel. Using Monitor Audio’s C-CAM gold treble unit and MMP II woofer enables authentic hi-fi sound quality. The Ceramic Coated Aluminium Magnesium gold treble unit provides an extended frequency response for a treble response that's even, sweet and detailed. Built for ceilings, it can also be mounted in a wall for superior versatility. It comes in a neutral dark grey colour with a white grille but can be painted to blend seamlessly. Monitor Audio C180 T2 is the core of superior sound installation. It can be supplied with an optional square grille.